After the huge success of 21 Jump Street in 2012, it came as no surprise that developments were soon underway for a sequel. Would it live up to the original or will it be doomed to become yet another unimaginative paint-by-numbers comedy follow-up? In a way, both boxes are ticked but the self-awareness of repeating the formula cleverly causes the audience laugh at and with the film simultaneously. 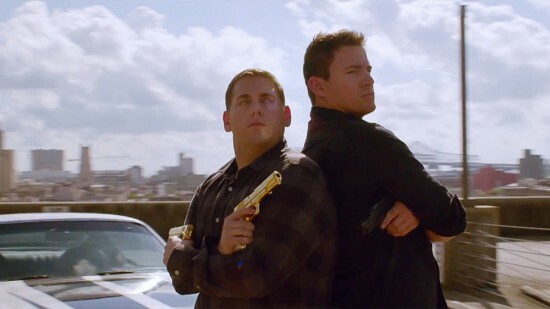 The first saw cop duo Schmidt (Jonah Hill) and Jenko (Channing Tatum) go undercover in a high school to investigate a drug problem, based on a 1987 television series. This time around, they do the same, but in a college! Hardly a leap forward in plot development, as the writers and characters will be first to admit, but there are more than enough big laughs to make it work. The budget thrown at a second go becomes a recurring joke and despite the gag, the stronger product value is evident in the film itself also. Proceedings open with a hilariously exhilarating chase sequence and a lot of fun has been had with the freedom of milking the profits of the predecessor. Flavours of other recent pictures of the same ilk are to be found, with the frat-pack humour of Bad Neighbours and a finale in Spring Breakers territory, so it seems the Apatow University alumni still don’t mind referencing the work of friends and collaborators. The directors, Phil Lord and Christopher Miller, are known mainly for their work in animation, such as the Lego Movie, and this unrestricted manner lends a playfulness and creativity to their work. Inventive cuts and transitions often add to the amusement, juxtaposing the styles and statures of the leads, and a whacky split screen trip segment involving a fashionable new drug known as WHYPHY is among the highlights. Jonah Hill and Channing Tatum are both on spectacular form, as Tatum again adapts seamlessly into the improvisational approach to comedy that Hill is associated with. Their partnership, on paper, shouldn’t really be as natural as it appears on screen but you get the feeling that their friendship is genuine which helps the humour on its way. They are joined by a solid supporting cast including Ice Cube who is fantastic as crazed police chief, Dickson. The sub plots are typical but well judged, as are the cameos which get better continuously until the brilliant closing credits which carries the franchise longevity joke further than you could imagine. The magic of ’22 Jump Street’ is that it doesn’t try to be anything it’s not, and because of this, it doesn’t overreach. It already has a winning formula so simply repeats itself, and self-parodies with the wit needed to get away with it, making it the funniest in-joke of the year. This entry was posted in DVD and tagged 22 jump street, channing tatum, jonah hill. Bookmark the permalink.